This recipe ticks all the boxes - quick, easy and kid friendly. Share the moment #youplateit with us on Instagram and Facebook - we love to share your triumph. 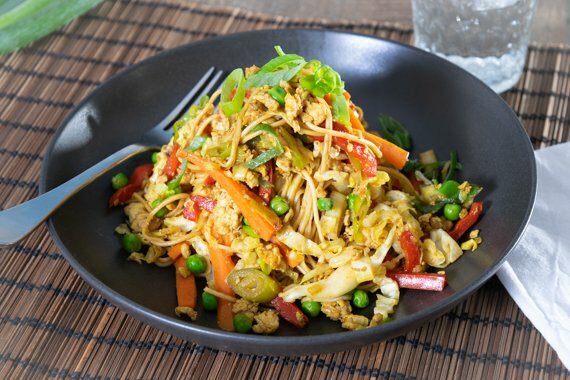 Fun Fact: The words chow mein mean 'stir-fried noodles', chow meaning 'stir-fried' (or "sautéed") and mein meaning 'noodles'. Wash the fresh produce. Peel and cut the carrot into matchstick size pieces (alternatively, you can just use a box grater). De-seed capsicum and thinly slice. Thinly slice spring onion on a slight angle, keeping the white and green parts separate. Peel and mince garlic. Finely shred cabbage. Put a pot of water on to boil for cooking the egg noodles in step 3. Heat a drizzle of olive oil in a non stick pan over medium heat. Add mince, breaking up any lumps with a wooden spoon and cook 3 - 4 minutes, until lightly browned. Add the egg noodles to the pot of boiling water. Cook 2 to 3 minutes, or until tender. Drain thoroughly and rinse under warm water to prevent the noodles from sticking together. Add the carrot, capsicum, garlic and white parts of spring onion and stir fry 3 minutes. Add the curry powder and stir fry for another minute or until fragrant. Add the oyster & soy sauce, noodles and ½ cup water. Stir fry for 2 minutes or until well combined and sauce has thickened slightly. Add the peas, cabbage and green parts of spring onion and stir fry for 1-2 minutes or until cabbage just wilts. Divide among serving bowls, garnish with any remaining spring onion and enjoy!